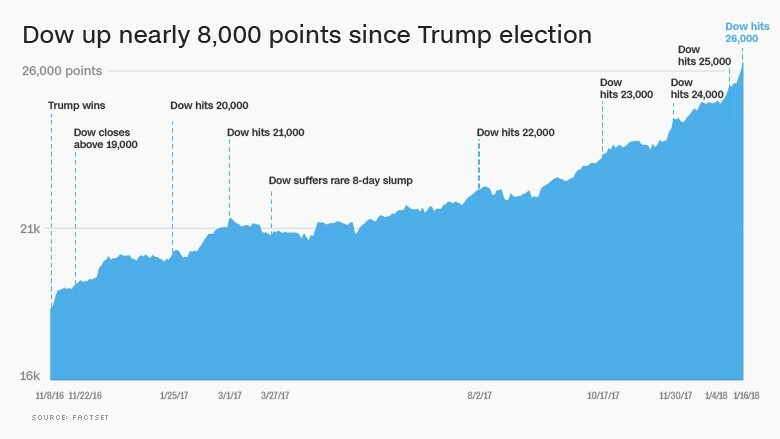 1.S&P Hits New All-Time Highs. It’s a big one so far. According to FactSet, earnings have come in 6.3% ahead of expectations. The five-year average is 4.8%. At this rate, better-than-expected results might be enough to pull earnings just above break even versus a year ago, averting an earnings recession. I took my 18 year old daughter to vote for the first time today in the greatest country in the world. 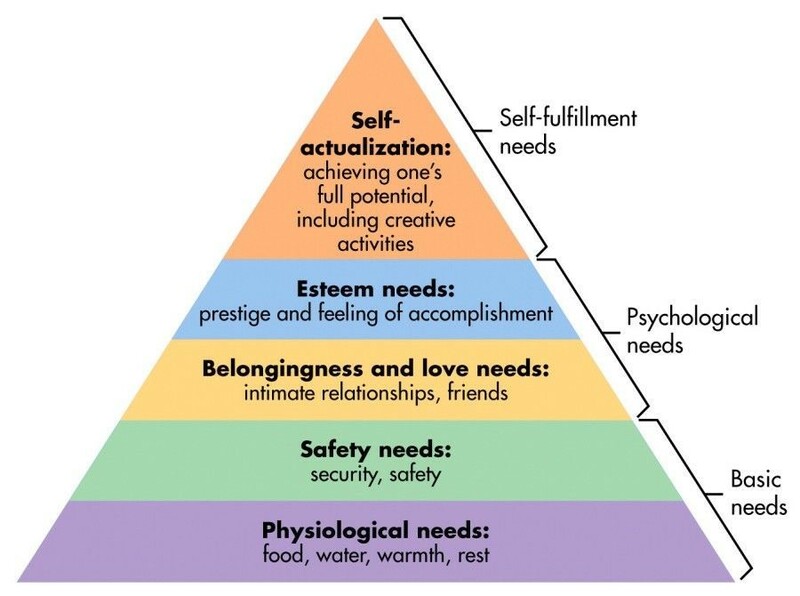 At Fortis, we build portfolios starting with one underlying thesis, investing is a psychology game not an IQ game. Markets don’t create losses, people do through emotional decisions at precisely the wrong times. There is nothing that generates more emotion than politics especially in 2018 with the events of the past month. 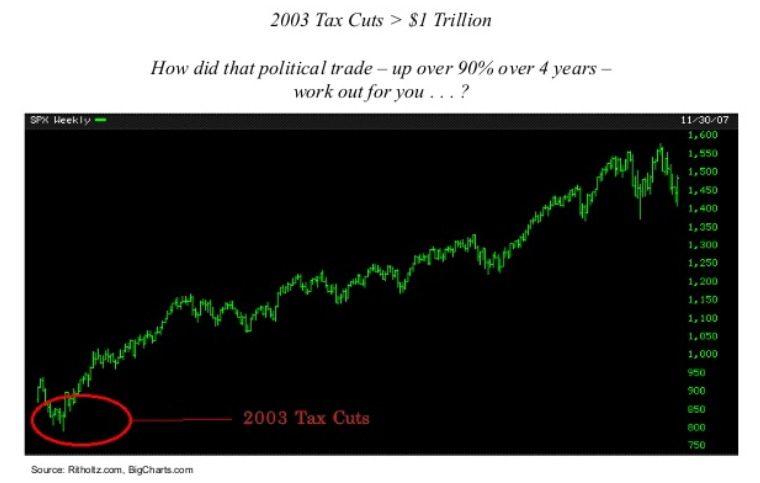 Unfortunately, I have bad news for heavily partisan readers, the economic cycle is much bigger than either political party so predicting market returns based on election results will have a negative effect on your long-term returns. 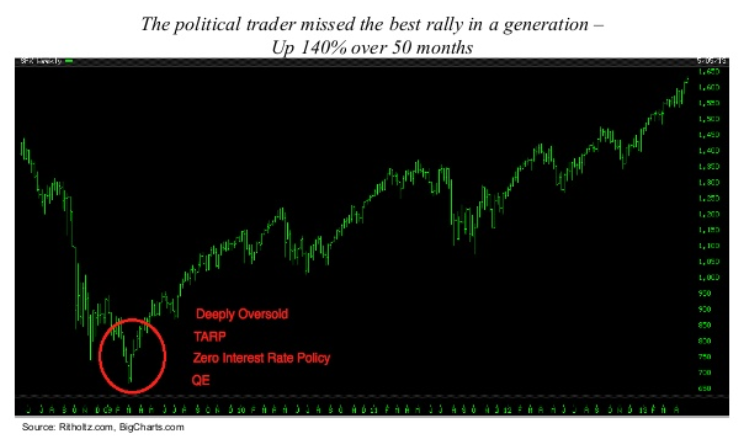 There is only one thing that mid-term elections guarantee, short-term volatility that should be totally ignored by long-term investors. 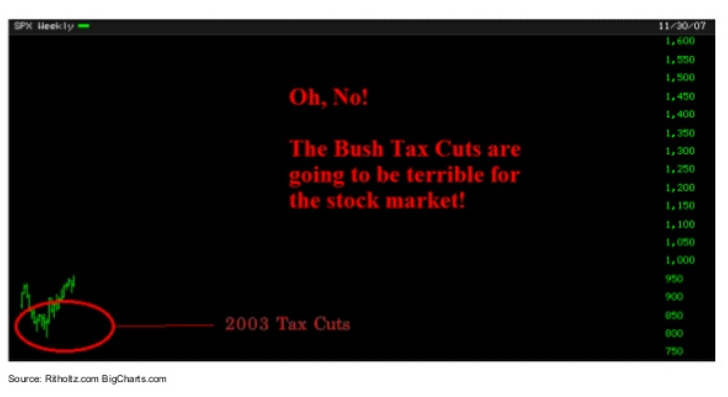 If you are a wild partisan person who is sitting on the edge of your chair at midnight waiting for results, that’s OK just get mentally prepared to avoid watching your portfolio at all costs. 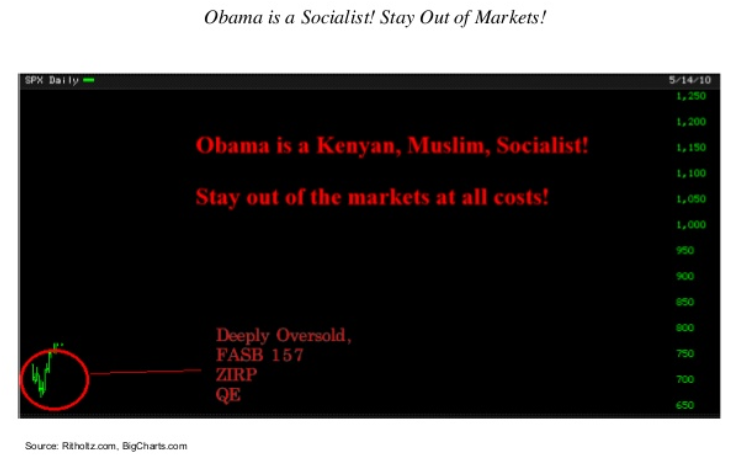 History suggests the stock market will fare well no matter who wins on Nov. 6. 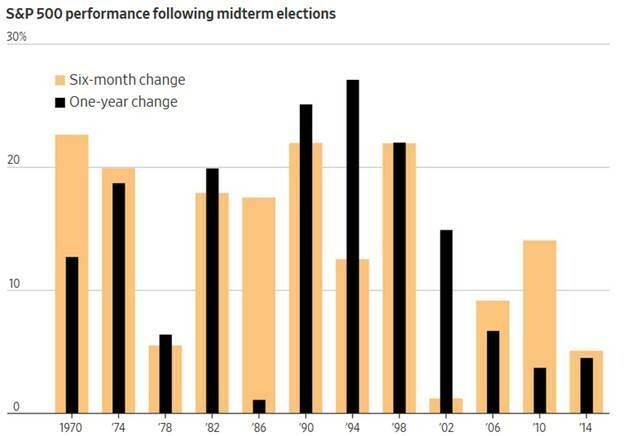 The S&P 500 has risen in the year after every midterm election since 1946 – Buy, sell or hold: Ten ways to trade the U.S. election (Reuters) From Dave Lutz at Jones Trading. 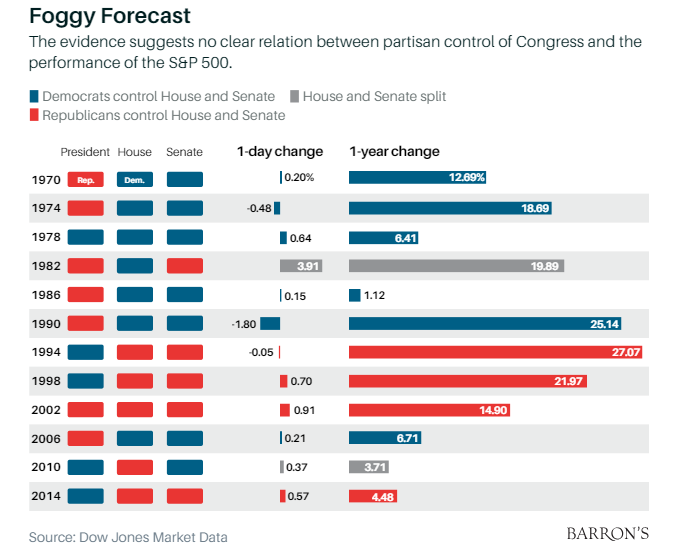 Predictions Around Recent Presidential Elections …Uhhh ! Not So Good. 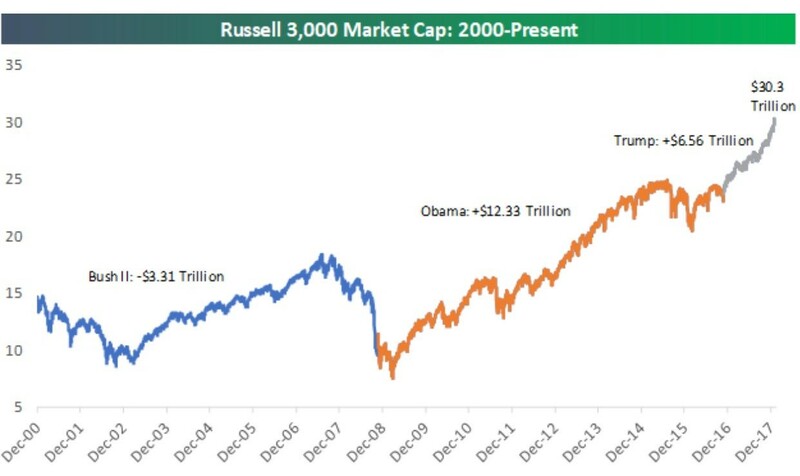 The economic cycle is bigger than any President. 1.8 Tech Stocks Market Cap Bigger Than Europe, EM and Japan. The most prominent US and Chinese tech stocks are worth more, by market cap, than the stock markets of the eurozone and Japan. Facebook, Amazon, Apple, Microsoft, Google, Baidu, Alibaba, and Tencentare worth $5 trillion, according to data compiled by Bank of America Merrill Lynch. US tech stocks are worth even more, at a $6.6 trillion market cap. Michael Hartnett, BAML’s chief investment strategist, has cited this size as a reason investors should reduce their exposure to tech stocks. 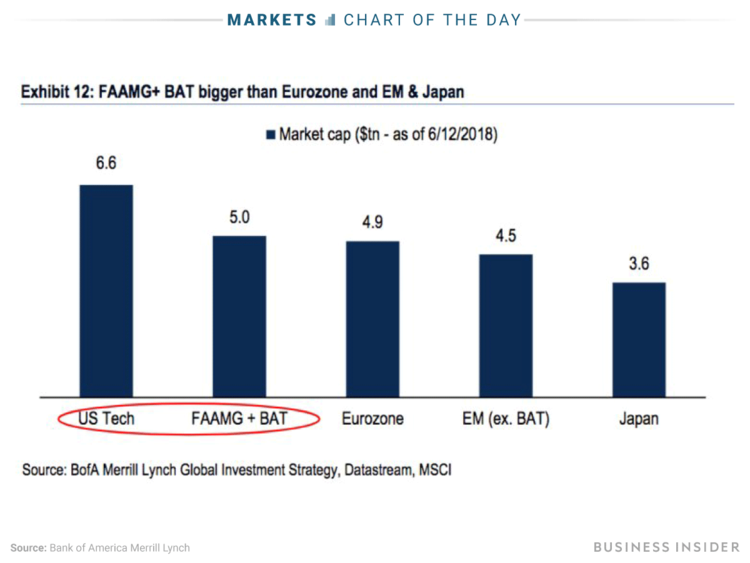 “Long FAAMG + BAT” is considered the most crowded trade, according to BAML’s global fund-manager survey. Here’s your stat of the day: Eight tech companies are worth more than the stock markets of Japan and the entire eurozone. The companies make up what Wall Street has abbreviated as “FAAMG + BAT”: Facebook, Amazon, Apple, Microsoft and Google (or Alphabet), plus the Chinese tech companies Baidu, Alibaba, and Tencent. As of last Tuesday, they had a combined market capitalization of $5 trillion, according to data compiled by Bank of America Merrill Lynch. US tech stocks were worth even more, at $6.6 trillion. Amazon founder and CEO Jeff Bezos, the wealthiest person in the world, is richer than he has ever been before. Since June 1, the tech titan’s net worth has grown over $5 billion and now totals $141.9 billion, according to the Forbes World’s Billionaires list. That makes Bezos worth roughly $49 billion more than Bill Gates and about $60 billion more than Warren Buffett. This latest win for Bezos is just one of many he has enjoyed this year. 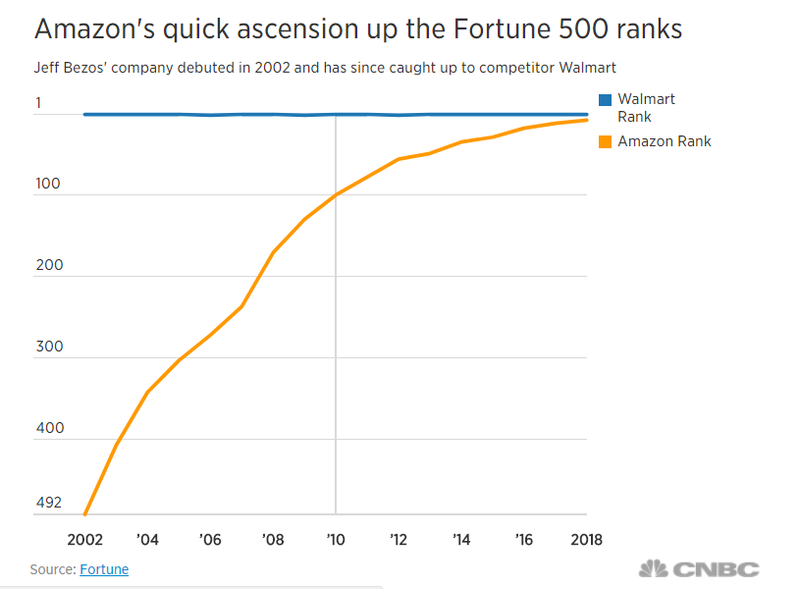 As Amazon’s customer base sticks around despite the latest Prime latest price hike in exchange for a slew of services and perks, the company’s stock has continued to increase in value. Even Buffett now regrets not investing in Amazon when he had the chance. Earlier this year, Bezos officially became the richest person in the worldand also helped make Amazon the second most valuable company in the world, behind Apple. And his success can arguably be traced back to a risk he took when he was 30 years old. 3.The Money Thrown Around By Big Tech Is Mind-Boggling…Google Invests $550 M for 1% Stake. The deal, which according to a JD spokesman gives Google a 1% stake, will help both companies expand their retailing presence. Under the partnership, JD will start selling products on Google Shopping, reaching consumers in the U.S. and Europe as it seeks to diversify beyond China’s highly competitive e-commerce market. Google Shopping shows retailers’ ads for goods above the blue links in Google’s search results for many types of products, like apparel and appliances. The search giant is building alliances as it races Amazon to develop new ways for people to shop, from voice-enabled smart speakers to faster and more convenient home grocery delivery. Equity Markets: The S&P 500 has diverged from investment-grade spreads. 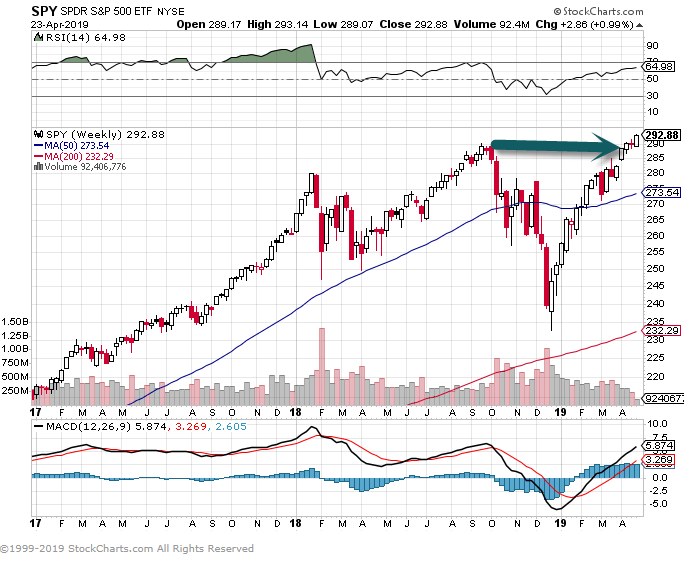 has accelerated toward the Fed’s 2% target. 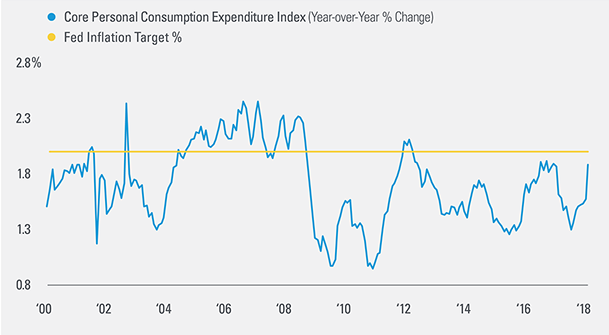 – The PCE has not yet breached the 2% level, and in fact has not been over target since a brief stretch in early 2012. The ETF industry’s biggest ETF issuer doesn’t often shut down ETFs, but when it does, BlackRock’s iShares arm tends to do it in the summertime. iShares announced today that it will be closing 16 ETFs, almost all of them falling under the smart-beta rubric. The funds’ last day of trading will be Aug. 15. 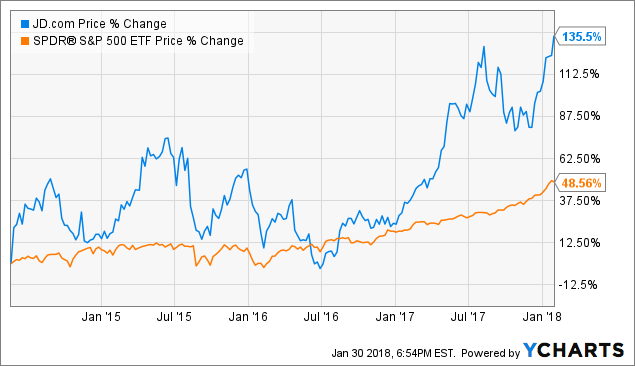 Of the nonsmart-beta ETFs that are shuttering, the iShares Currency Hedged MSCI Europe Small-Cap ETF (HEUS) launched in 2015, and only has about $3 million in assets under management (AUM), while the iShares Currency Hedged MSCI ACWI ETF (HACW), which launched around the same time, has $6 million. The iShares Currency Hedged International High Yield Bond ETF (HHYX), another 2015 launch, has less than $2 million in AUM. iShares joins other asset managers that have closed currency hedged equity ETFs that were the rage in 2015 after failing to gather assets. Back then it seemed as if the currency hedged train would be unstoppable as HEDJ, DXJ, DBEF and others topped the leader board. But when the dollar reverses, it’s harder to meet minimum thresholds to remain viable,” said Todd Rosenbluth, director of ETF and mutual fund research at CFRA. The entire family has roughly $50 million in AUM. 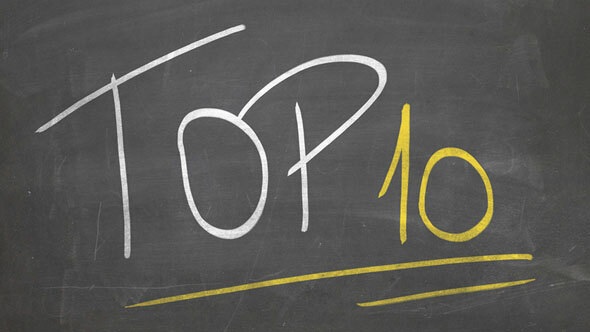 The products were launched in 2016 after John Hancock rolled out its own family of multifactor sector funds based on indexes created by Dimensional Fund Advisors. Those funds currently have about $365 million in AUM after a slow start. “iShares had already moved on from multi factor sector products when they launched the active iShares Evolved suite, including theiShares Evolved US Consumer Staples ETF (IECS). Investors have focused on market-cap-weighted and to a lesser extent on equal-weighted sector ETFs, but anything else more complicated to explain has struggled to garner interest,” Rosenbluth noted with regard to the scheduled closures. The total number of closures so far for 2018 far outpaces the record-breaking amount of shutdowns that occurred in 2017; that’s mainly because of the 50 iPath ETNs that were shuttered earlier this year. Factor out those closures, and numbers are comparable with 2017. This latest announcement just adds more weight to the idea that 2018 will demolish 2017’s record. 7.Americans Eating Out Equal to Home. 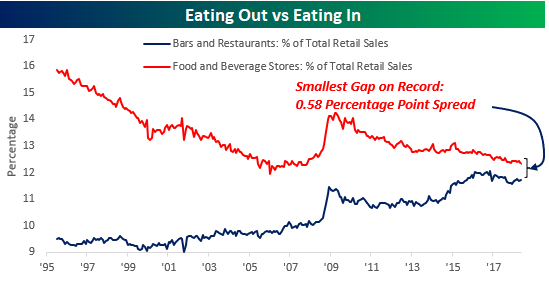 The chart below compares the historical share of total sales that eating in (Food and Beverage Stores) and eating out (Bars and Restaurants) have accounted for. With “Eating In” accounting for 12.31% of total sales and “Eating Out” accounting for 11.73%, the 0.58 percentage point gap between the two categories is the narrowest it has ever been. What’s even more fascinating about the shift in eating trends over the last 20+ years is the fact that even as Americans have changed where they eat (out vs home), the percentage of total sales that “food and beverage” account for has held steady. Combined, the two categories currently account for 24.05% of total retail sales, and that compares to a historical average of 23.64% going all the way back to 1995. In the house of the future, what will replace the kitchen?